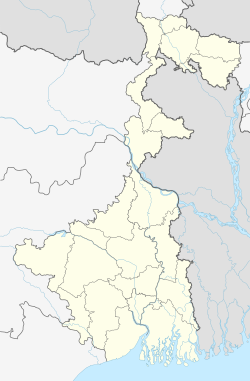 ↑ The Kolkata metropolitan aurie includes portions o North 24 Parganas, South 24 Parganas, Howrah, Nadia, an Hooghly destricts an aw. See: Urban structure. Kolkata (Bengali: কলকাতা [ˈkolkat̪a]), umwhile kent as Calcutta, kent in Scots as Cawcuttie an aw, is the caipital o the Indie state o Wast Bengal. Kolkata is the commercial caipital o Eastren Indie, locatit on the east bank o the Hooghly River. 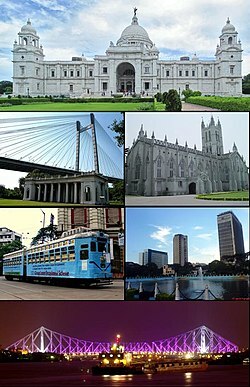 The Kolkata metropolitan aurie, includin suburbs, haes a population exceedin 15 million, makin it the third maist populous metropolitan aurie in Indie an the 13t maist populous urban aurie in the warld. The ceety is an aa clessifee'd as the aicht lairgest urban agglomeration in the warld. Kolkata served as the caipital o Indie durin the Breetish Raj till 1901. It is said that the Breetish coud no cope up wi the lang lastin monsoons in Eastren Indie an fled tae northren Indie, an merked New Delhi as the new Naitional Caipital. The ceety is notit for its revolutionary history, rangin frae the Indian struggle for unthirldom tae the leftist an trade union movements. Ance the centre o modren eddication, science, cultur an politics in Indie, Kolkata witnessed economic stagnation in the years follaein Indie's unthirldom in 1947. Housomeivver, syne the year 2000, an economic rejuvenation haes led tae an acceleration in the ceety's growthe. Lik ither metropolitan ceeties o Indie, Kolkata continues tae struggle wi urbanisation problems lik poverty, pollution an traffic congestion. Kolkata haes sister ceety relationships wi the follaein ceeties o the warld. ↑ "Sovan Chatterjee to be new Kolkata mayor". Hindustan Times. New Delhi. 6 June 2010. Retrieved 26 April 2011. ↑ "Doctor to be next sheriff". Times of India. New Delhi. 5 January 2011. Retrieved 27 January 2012. ↑ "Pachnanda selected as new Calcutta Police Commissioner". The Telegraph. Kolkata. 17 March 2011. Retrieved 26 February 2012. ↑ "Kolkata Municipal Corporation Demographics". Census of India. Retrieved 3 June 2016. ↑ "District Census Handbook - Kolkata" (PDF). Census of India. The Registrar General & Census Commissioner. p. 43. Retrieved 13 May 2016. ↑ "Urban agglomerations/cities having population 1 million and above" (PDF). Provisional population totals, census of India 2011. Registrar General & Census Commissioner, India. 2011. Retrieved 26 January 2012. ↑ The Monthly Repository and Library of Entertaining Knowledge. 1833. p. 338. ↑ "World Urbanization Prospects: The 2005 revision" (PDF). ↑ Moitra, Sumali (2004-01-11). "Brand Bengal to get a bite of the Big Apple". Timesofindia.indiatimes.com. Retrieved 2004-03-03. ↑ "Some images are synonymous with Kolkata". India Today. January 2, 2009. Retrieved 2009-03-03. ↑ Bose, Krishanku (December 14, 2007). "Kolkata". 2point6billion. Retrieved 2011-01-21. Wikimedia Commons haes media relatit tae Kolkata.